Believed to be one of the oldest breeds of domesticated dog, the Saluki evolved in the Middle East to assist early man, the hunter. Studying the antiquity of these beautiful hounds reveals that they hunted for the ancient Egyptians and for their Mesopotamian masters as well as being accomplished providers of food for the nomadic tribes who roamed the desert sands of the Arabian Peninsular. One of the earliest illustrations of the breed was found at an excavation at Tepe Gawra near Nineveh, capital of the Assyrian Empire. It is dated at between 2000-3000 BC, and depicts the Saluki in various poses on a seal, showing the same phenotype we expect to see in the show ring today. Similarly, at other excavation sites, numerous paintings and carvings of Salukis are in evidence, the most exciting of which appears in the tomb of Tut-ankh-Amun. 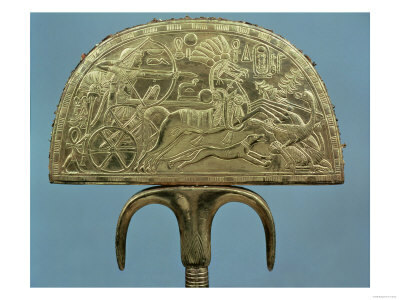 On a number of items in the burial chamber and treasury, the boy king is shown hunting gazelle and lions with his Salukis, and on a funerary casket is shown charging into battle in a chariot drawn by two stallions and accompanied by two white Salukis. The Arabs believed the Saluki was a sacred ‘Gift from Allah’ and regarded it as El Hor- the noble one. Such was the esteem in which they were held that they shared their masters’ tents and were allowed into the women’s quarters. This was in strict separation from the mongrel dogs (kelb) that were regarded in the Islamic religion as ‘unclean’. 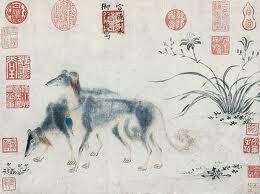 By tradition, Salukis were not bought or sold but presented gifts or as marks of honour. Due to the immense size and variation of terrain and climate in the Middle East area, originally each tribe had Salukis best suited to hunting the particular game in its own area. So it followed, that those presented as gifts to Europeans, brought to the West dogs that varied accordingly. Gradually, Salukis found their way to Europe with traders, travellers, invaders and Crusaders but they did not become widely known until the end of the 19th century- more particularly after the colonial rearrangements of the Middle East following World War 1. The first recorded Saluki in England was in 1835, and in America 1861. The Hon. Florence Amherst, who had been attracted to the breed while working with her father exploring Egyptian tombs and antiquities, imported a number of Salukis from different geographical areas and became a prolific breeder and campaigner in England. She wrote extensively on the environment and characteristics of the breed. Together with Brigadier General Frederick Lance, whose black-and-tan import became a legendary early sire in the breed, they formed the ‘Saluki or Gazelle Hound Club’. 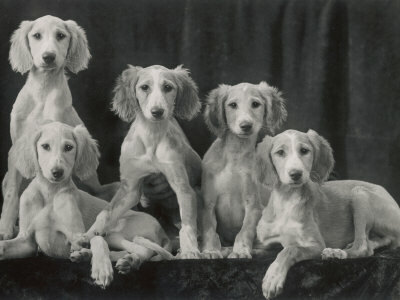 The FCI (World Canine Organisation) acknowledges the English as having the first official breed Standard for Salukis following the formation of the Club in 1923. That Standard is still in use today in the USA where it is claimed that the Saluki has the oldest unchanged Standard in the world. It is also the Standard in Australia and New Zealand, where we include the words "or variations of these colours" (in relation to accepted colours), that were added by the Kennel Club (UK) in 1950.